That Nelda Roundheels had been murdered would have been of little interest to anyone - except that her body turned up in the bishop of Winchester's bedchamber with a letter to the bishop, from the king's most important enemy, rolled up in her breastband. The bishop and his knight, Sir Bellamy of Itchen, realize immediately that the purpose of putting the body in Winchester's bedchamber is to embarrass and discredit the bishop. And the reason for this attack on Winchester is his calling of a convocation to chastise the king for acting high-handedly against the bishop of Salisbury. Had the king himself ordered this outrage? Had the king's favorite, Waleran de Meulan, ordered it? Unfortunately the answer is not so simple to find; there are many other noblemen who want the king's favor and might attack Winchester to get it. To save Winchester's reputation it is urgently necessary to discover who killed the woman and who placed her in Winchester's bedchamber. Bell, to his mingled joy and distress, is ordered to ask Magdalene la Batarde, whoremistress of the Old Priory Guesthouse, once his lover but now estranged, to help him solve the mystery. ©2006 Roberta Gellis (P)2012 Audible, Inc.
Great book. A real shame about the narrator. Would you consider the audio edition of Chains of Folly to be better than the print version? Sadly, no, the print edition is much better. This is a wonderful story - much more involving that the first three books. (As hard as that is to believe! The first three were amazing!) The narrator made this recording painful. What was one of the most memorable moments of Chains of Folly? I would have to re-read the book. Thinking back at the recording I've just finished, I keep grinding my teeth at the painful "personality" the reader tried to give the characters, and can't get past them. I think perhaps the early battle scene where Bel protects the Bishop? Her narration was sing-song. Her characterizations were massively irritating. The Bishop always snarled. Bel always hissed and drawled. Magdalene sounded continuously air-headed. Diot sounded like a back alley tough. Although everyone was "speaking" French, one character had an affected French accent. Right up until the narrator forgot who was talking, then the wrong painful "voice" said the next line which didn't belong to them. A lighthearted bit of slap and tickle is a lot of fun - right up until someone steals the state secrets. What disappointed you about Chains of Folly? The narrator was horrible - I don't believe she had read/listened to any of the earlier works. She made Madelaine sound simpering and stupid. I couldn't get past the first few chapters. What was most disappointing about Roberta Gellis’s story? Good story but this narrator is too sing-song-y for my taste. Every sentence seems to have the same rhythm, the same inflection. It's soporific and makes it very hard to follow the actual story line. 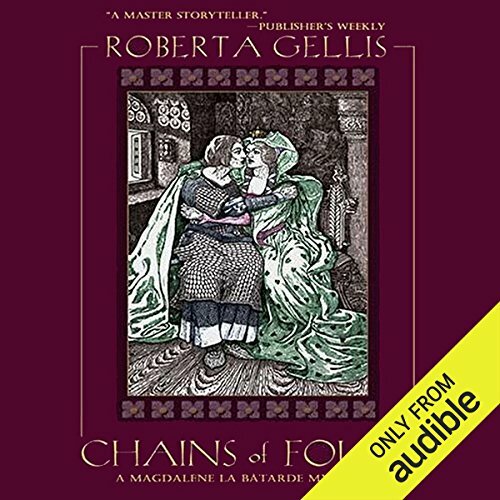 Where does Chains of Folly rank among all the audiobooks you’ve listened to so far? In terms of the story, among the better ones. I have long enjoyed this series. But the performance was terrible! The only reason I listened to the end was because I am a Roberta Gellis fan. Characterization of different voices, different genders. At points I actually muted because I simply could not stand her reading and characterizations. The story is fine, especially if you are familiar with Roberta Gellis's other Magdalene stories. But the narrator! Oh, the narrator! She places the same emphasis on every sentence, thereby ruining the cadence of the story. Everything is said with a breathless disbelief that makes something simple such as "set the bread on the table" sound like she's calling a horse race. It's awful. I would not. The narration was very poor and detracted from the story. The mystery was well crafted and the outcome was not immediately evident. I am tiring of the angst filled relationship between the Bell and Magdalene. The series is becoming a bit too much of a romance for my tastes. She has very little range in her characterizations. Magdalene sounds breathy and simpering rather than the strong, confident character that is written. Also, she and Diot sound so much alike it is difficult to tell them apart. Although written as childlike, her Ella is a caricature of a little girl voice and it is actually disturbing to listen to her delight in her profession. The Bishop of Winchester sounds like Snidely Whiplash. Suffice it to say, I will not listen to any more books with this narrator. I grabbed CHAINS OF FOLLY as soon as I saw it was available, in spite of the beating the new reader was taking from listeners. The Magdalene la Batarde series is a delight for medieval mystery lovers, and CHAINS OF FOLLY is no exception. I wish Gellis had continued the series after this. It is the rare reader who can produce both male and female voices faithfully, and this reader's voice is especially high. She shouldn't even try to sound male. The more successful strategy is to create the character by temperament, not timbre. However, her comprehension of the author's intention seems superior. Despite the narrator's sing-song reading through much of the story, the story carried itself fairly well until the critical moment of The Big Fight, where there was a major part of the action missing from the recording! (Part 2, 4:14:36). Were there pages missing from the book itself or did the person overseeing the recording nod off? I do love Roberta Gellis, so I bought this despite the negative review about the narration. It's not Susan Duerden's best, but I found that it improved as it went along and I did enjoy it. She is a whore, and so much more. I am a fan of the late Roberta Gellis. She was a student of Medieval history and the time period comes to life in her books. Magdalena is a woman who has learned to survive and prosper without losing her humanity. Bell is a warrior and a good man. They learn from each other and serve justice in the process . This is the last book in the series, I wish there were more.